With the hardware BLM, my rough calculations were about $300 with a case, panel, PCB, LEDs and Livid buttons/spacers. So, a wireless BLM for ~$500? + iPad multi-use = win in my book. I'm away from my studio for Christmas etc but the first week in January I will be rocking this out. I will also test it with my USB MIDI as well and let you know how that works. Would it be possible to run this under android? The reason I ask is on ebay there are some cheapo touchscreens going for around Â£80gbp,now I know they are not up to ipad standards but I am having to pull in the reins on my spending a bit. So,can anyone tell me what would need to be done to run this on android or is it a total none starter? I uploaded v1_002 of the lemur patch (link: see first posting). 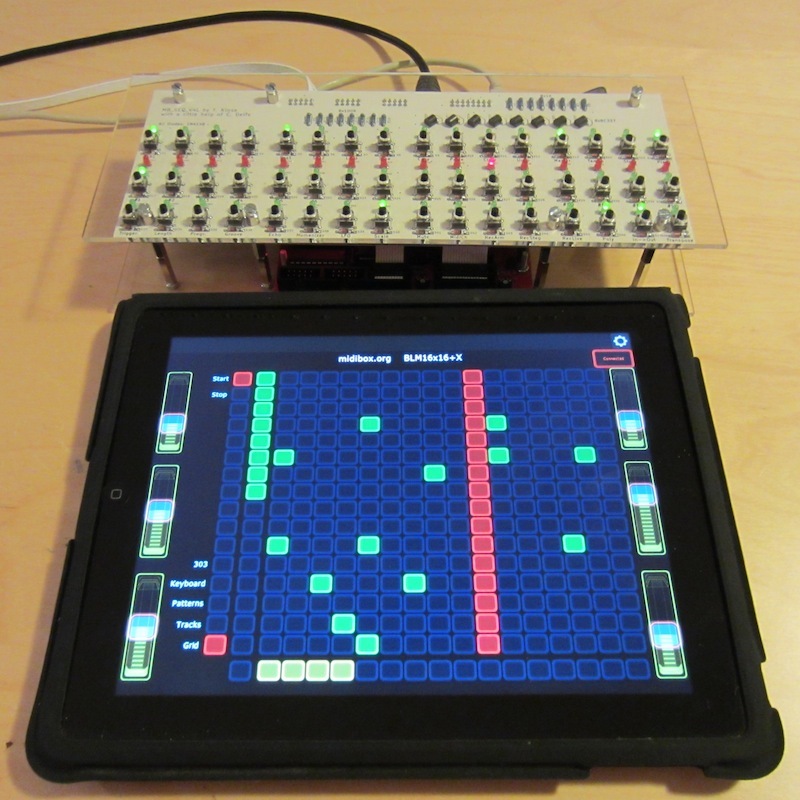 It now supports direct communication via Ethernet (OSC), so that no computer is required to pass MIDI events to the iPad! (MBSEQ V4.055 resp. V4L.055 upwards required). Maybe there is a future for android with TouchOSC. There is an editor for it (Windows/OSX/Linux). So i assume a compatible template could be made for it. However the editor seems to be only for iPad/iPhone atm. So not sure it will work for the Android counterpart. Edit: It won't work. Apperantly the next update should fix that. TouchOSC isn't flexible enough for a BLM. The grid doesn't allow multi colour, and each "led" has to be accessed with a single OSC packet, which would slow down the system performance of MBSEQ dramatically -> makes it unusable. With Lemur it's possible to decode incoming MIDI/OSC messages with scripts, and this makes the application much more powerful than TouchOSC, and finally made the BLM emulation feasible. E.g. 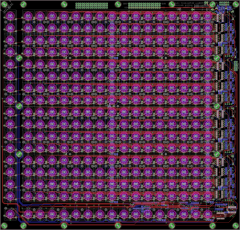 the whole 16x16 grid can be updated with a single OSC packet, and I'm able to define if LEDs should be accessed in vertical or horizontal direction (which helps to improve performance as well). For TouchOSC we would need to send 256 individual packets! Accordingly, only an application like Lemur can be used for such purposes, or a selfwritten application of course. Anyways hopefully there will come some kind of solution for Android too. But Liine doesn't seem to have Android high on it's prio list. Might not be bug free at current, and the Android version's a little old, but it appears to be both open source and fully user scriptable for the interfaces. Jeez, tempted to jump on that midibox-ipad-lemur-bandwagon..
Once again, congrats! Really fine project TK! Note that you don't need "iConnect" or any other MIDI hardware device. 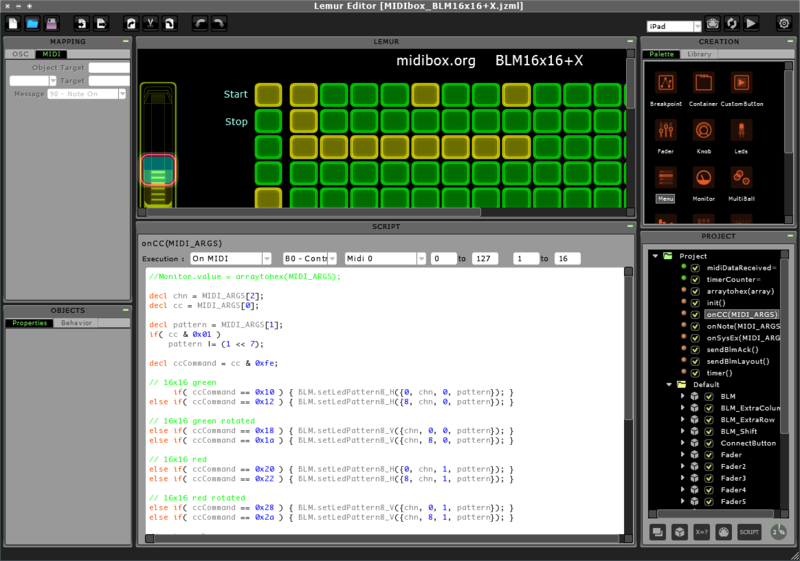 MIDI data is transmitted through the Lemur Daemon, which is running on a computer (Mac or Windows PC). Alternatively, MBSEQV4L can directly communicate with the iPad via Ethernet. ..thought about playing live initially, so that was the mindset for "midi cabling required".. wifi(!) ipad => mobile wlanrouter(via cable)=>ethernet socket of LPC17/SEQ, right? Aha I may have caused confusion mentioning the MIDI interface. Sorry if I did. You can of course just use the WiFi functionality (there's a daemon for Lemur which you run on your computer and that does the magic of converting the WiFi connection to a virtual MIDI connection). And this functionality is great in the studio, you can sit where you like and jam on MBSeq, very cool! can somone explain me what the app does? Is it a front end for the Midibox Seq or an emulation of it? Btw. I would always prefer the midi cable connection over wifi especially when a clock is involved. But I noticed that ad hoc connections between ipad and computer are way better than going over the router. Sadly adhoc connections can only be protected with WEP. Haven't found a solution for this (but i am not so sure if there are security issues in ad hoc connections ar all). The communication can be realized via the Lemur demon (-> e.g. MBSEQ connected via USB to a PC/Mac), or directly via Ethernet - MBSEQ supports both options. I do agree, therefore I prefer to run the sequencer engine on a microcontroller instead of the iPad, because iOS can't guarantee stable timings as well, especially once the sequencer should be synchronized to an external MIDI clock. Do I need a full SeqV4 lite to try this or can I do anything with just a LPC17 core? Yes, you can try this without the control surface. Been awhile since I stopped by. TK You made a ton of progress! I am curious now, after building v4L and the Lemur BLM, is the BLM in use with the MBSEQv4 still the way to go? or can you run the two sequencers side by side and use the one lemur BLM to switch between the two quickly? Are you now using all three together? I'm going to get an iPad sometime in the near future just for lemur with your template and after seeing the v4lite now I want to build one too. I'm still trying to figure out this statement. this looks very, very, very interesting! 4) Can iPad(with Lemur) be directly connected to MBSEQ USB with Camera Connection kit for USB-midi or OSC communication??? This last (4) option would be optimal solution for me if it worked. Can it work theoretically? Has anyone tested this? 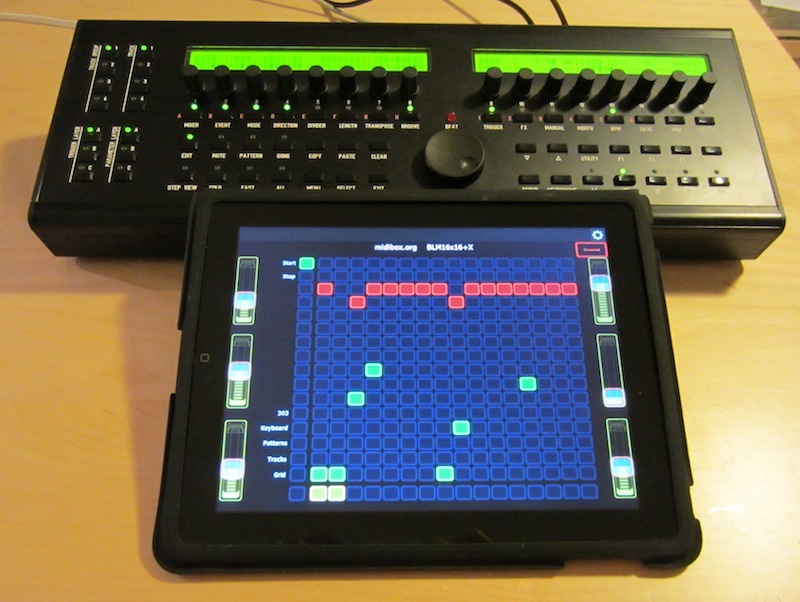 iPad Genome sequencer app and Midibox functionality. has nice real-time sequencing/arpeggio functionality. do not own Mac what is required to program for iPad. be emulated connecting midibox and lemur together. So I loaded "MIDIbox SEQ V4.058" on my LPC17 with no sequencer or anything, just the core, not even an SD card. I then set the following in MIOS studio per the change log. Start the Lemur app and it connects and I can hit Start/Stop or keyboard mode and I can see the MIDI commands input into MIOS console. Now how do I route this to the MIDI output of my core to my synth? Do I need to set router X in MIOS or do I do this in Lemur? If you are using the OSC option, no MIDI routing should be required as data is transferred directly via ethernet. Alternatively: install a SD Card and change the global MIDI port in the MBSEQ_C.V4 file, so that MBSEQ sends to MIDI OUT1 by default. I took the mini SDcard adapter route, because I really would like to in the end not attach a computer to this setup. I had a 4GB & 16GB FAT32 card around the house to try. For some reason, not all the files are able to be created on my SDcard? (Tried both). I will reformat the 4GB one and see if that has a different result. [11954.220] Retrieving SD Card informations - please wait! When I remove the mini SDcard and look at the root I see MBSEQ_BM.V4 & MBSEQ_GC.V4, but no MBSEQ_C.V4. Thanks for the help TK! I created the /SESSIONS/DEFAULT/MBSEQ_C.V4 file manually with the one value you noted. After that I proceeded with what the change log says. [47031.908] Retrieving SD Card informations - please wait! It must be the act of storing that is putting the above values? Still not working on MIDI out 1 sadly, but you've giving me some more info as to what needs to be configured, so I thank you greatly for this education. I will play with this some more and see if I can get it working.